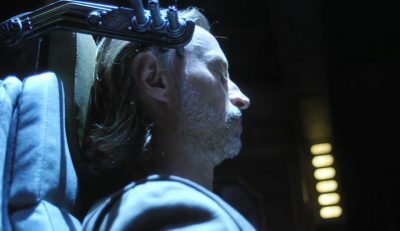 In the 14th episode of Stargate Universe “Human” the crew of the Destiny have to deal with some bad decisions by the gate team who venture into some tunnels within a long abandoned and derelict city. The tunnel system collapses blocking the exit and trapping Chloe, Scott, Greer and Eli underground with no way to navigate the complex pathways, they can however contact the ship and relief is sent to help dig them out but the clock is ticking and ultimately Lt. James and her people are unable to reach their friends and are forced to return to Destiny. Meanwhile depending upon your point of view the A or B story deals with Rush who after some tweaking of the “chair” has connected himself to it in the hope of revealing the key to the Destiny which they believe will allow them full control of the ship. Human is very much a Rush episode despite the rather traumatic events going down on the planet which themselves would easily carry an episode. However seeing so much back story to the enigmatic Rush is very absorbing even though we are seeing him experience his past (Louise played his wife Gloria perfectly) knowing it’s not real so his actions are different to what they were. That said so much is made clear and provides an explanation as to the character we first met in the opening episode who then proved to be rather aggressive, arrogant and short tempered. It was probably fitting that the sacrifice Franklin made by trying the chair first paid off allowing Rush to commune with the computer system of the Destiny and it was an interesting to see the merging of his psyche with the AI of the ship. We still are not clear as to what the Ancients equipped the ship with in terms of control systems, there seems to be some intelligence maybe even sentience there but it’s clear the Destiny is far from a starship controlled by simply programming. I was a little disappointed that the excellent choices in music during the episode were not more key to solving the puzzle of the ship but they did lead the way and maybe even Rush was able to learn something about himself which will temper his interactions with the crew. Rush aside it was a little reckless for the gate team to enter an unstable tunnel system in pursuit of a kino, it was simply a bad decision and a few more bad choices left them in an untenable position, the consequences of which may take quite a while to play out but the drama of time running out and then Destiny jumping to FTL was intense. Overall a very good episode with two significantly different stories and kudos to the director and cinematographer for making the two very different visualisations of the events work and look so well. I want to offer me thanks to Thomas for joining me on this podcast, Alan was unavailable to it was just the two of us and we had a good time with an episode I was not sure would hold our interest after so many viewings, I was wrong. Our thanks to both Mack (Google+) and Brad (voicemail) for the feedback and continued support from the Stargate fan community. This weeks podcast promo is for Treks In Scifi and next week we are going to be watching and chatting about the fifteenth episode “Lost” and we hope you listen and let us know what you think about the episode and any other other aspect of the franchise.